Happy Tuesday everyone! It is time for the 11th (already!) Question Wednesday! This is a really fun blog hop, so if you are interested, check out Nykki's Mane Blog. 1) What is your favorite girly hobby/interest? 2) Who is, in your opinion, a great example of a 21st century female role model? Hmm..probably Elizaveta, who is an amazing singer/songwriter. She is very talented, intelligent, incredibly hardworking and passionate. 3) What are your top 3 fave chick flicks? I hate chick flicks, actually. I'm not even a big movie person. I'm a bookworm. 4) We're having a sleepover! What snacks will you bring and what music will you play? I would make my aunt's amazing buffalo chicken cheese dip, guacamole and salsa on hand. Anyone else hungry? For music, I would bring out some 90's music as it can't be beat. I will say this, anyone who plays Adele or that stupid "Call Me, Maybe" song will be kicked out, or just kicked. 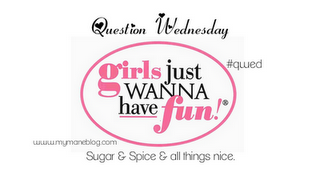 5) What is the girliest item that you own?